Those of you that have experience of playing IGT slots will be interested in this title from the Las Vegas-based developer. 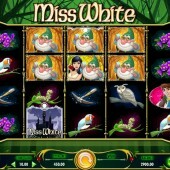 In a sequel follow-up to the fairytale-themed Miss Red, IGT has now added this Miss White slot to its ranks. Where as Miss Red took inspiration from the Little Red Riding Hood tale, Miss White turns its attention to the fable of Snow White and the Seven Dwarfs. It is a 5 reel, 1,024 ways to win slot and not only comes with IGT's brilliant MultiWay Xtra set up but has a feature familiar to Miss Red fans called End2End Symbol Expansion. Symbols on the reels are all related to the Snow White story, as you might expect. There is the handsome prince, the horrible witch, an owl, a bluebird, a ruby, a mining pick axe, a caterpillar, and some flowers. You are spared the generic 9-through-to-Ace symbols which adds some creative nous to the reels. Interestingly, there is no Wild symbol on Miss White. Instead there are two Expanding Symbols in the form of Snow White herself and one of the seven dwarfs. Apparently, it is Doc but feel free to change the name of the dwarf depending on your mood. It is these two symbols that also see the End2End Symbol Expansion feature come into play. The basic concept of this is that any symbol between two Miss White and/or Doc symbols on the same row turns into a Miss White symbol, except the Doc symbol that turns into a Miss White/ Doc symbol to create more winning combination possibilities. You will be pleased to hear that this slot is not all about the End2End feature. There is a free spins bonus round called the Magic Mirror Free Spins. This is triggered when you hit three Miss White logo symbols on reels 2, 3, and 4 at the same time on a single spin. You will be taken to a second screen where you must choose from a selection apples. The apple you choose will then award you a number of free spins between 5 and 15. 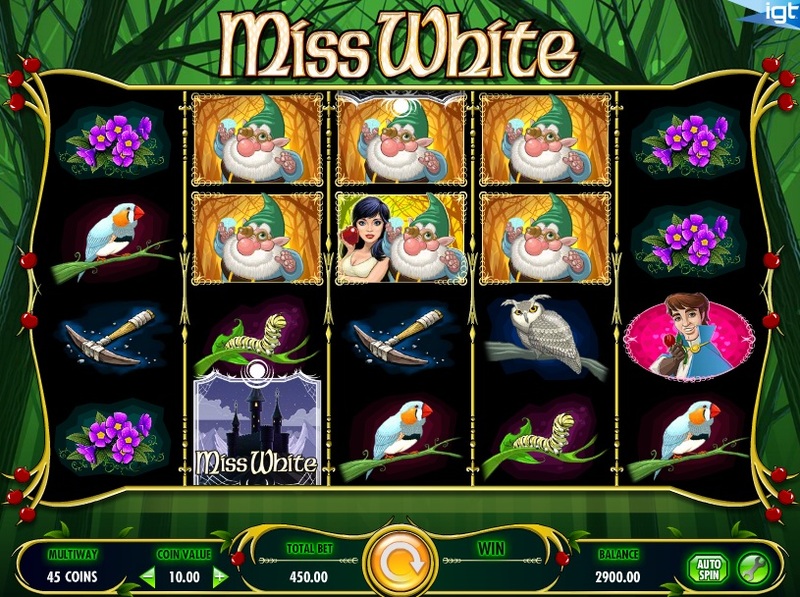 It is possible to re-trigger the Magic Mirror Free Spins with up to 280 free spins available to win. The stark improvement upon Miss Red within Miss White is the fact that on Miss Red it was only the wolf symbol that was part of the End2End Symbol Expansion feature. However, the fun has been doubled on Miss White with Miss White herself and Doc being involved in it. It is great to see IGT building a series of these slots relating to classic fairytales and it gets the imagination going thinking where they will go next. Cinderella? Rapunzel? Three Little Pigs? If you want more fairytale-related slots action then you should head on over to check out the action-packed Little Pigs Strike Back from Argentine developer Leander Games or WMS Gaming's own take on the Little Red Riding Hood tale with the Li'l Red Riches slot.